Originally published on Jan. 18, 2016 and last updated on Mar 29, 2018. All the wireless systems we recommend are compliant with the FCC regulations that come into effect in July 2020. 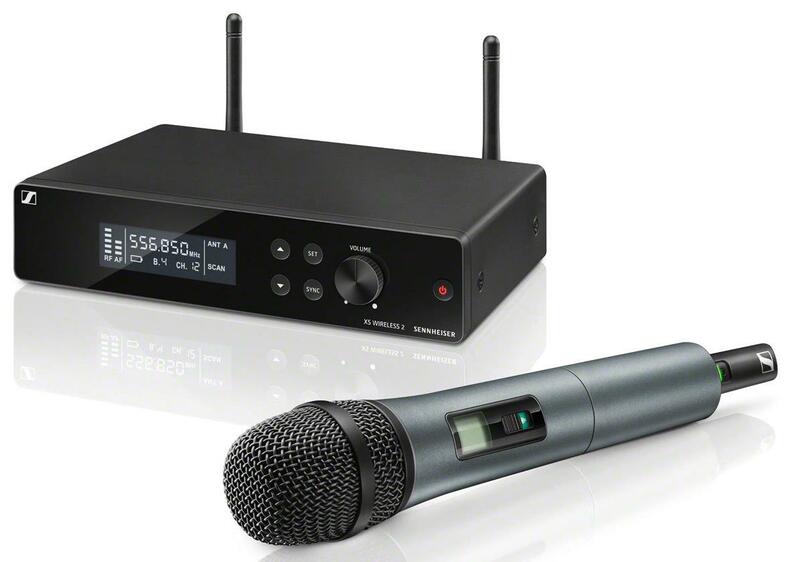 Here we present you with the best wireless microphone systems, updated for 2018, to help free you up as you sing or speak on stage. 87 out of 100. Incorporating 325+ ratings and reviews. The GTD Audio G-380H is a popular system due to its very low price. The price is kept down in 2 main ways - the system is not expandable and will cause interference if you try using 2 systems at the same time, and the microphones are only basic ones. The volume of each of the 4 mics can be set independently at the receiver and a mixed signal taken out, or you can simply take all 4 balanced XLR lines out independently to your mixing console. Although the majority of user reviews are quite favorable, some do mention quality control issues and a few report that one or more of their mics stopped working in less than a year. Most of the reports about range were positive with only a few users reporting interference or noise issues. Overall this is an okay system given the low price, however you must handle with care and don't expect the same year in and year out robust performance you would expect from a more expensive system. GTD Audio gets good ratings, not because they're the highest quality, but because they offer good value for money and those who are budget conscious rate this double mic package very highly. One of the most common positive comments about the GTD Audio 622H system is that the mics, although enclosed in solid plastic rather than metal, have a good weight and feel to them. The most commonly reported negative is that the second mic has problems with dropouts after a while, although the manufacturer will replace them under warranty. Most users are satisfied with the overall quality and performance of the GT Audio G-622H, especially when considering the price. Mobile DJs and event singers were happy with the sound quality as were those using it in fixed installations such as houses of worship. This is very much an entry-level system, and some report moving up to more expensive options after using it for some time, still it's hard to beat the extremely low price. Shure have combined their budget dual BLX receiver with their budget PG58 microphone to produce an affordable 2 mic system. The Shure PG58 mic capsule is a step down from the SM58 in terms of ruggedness, while many people on forums debate whether or not the sound quality is nearly as good as an SM58. The debate is open, but the majority opinion is that the PG58 sounds good, just not quite as good as the SM58. Most of the positive reviews centered around the quality of the mic when compared to other cheaper dual systems as well as the battery life of the transmitters. Its biggest asset is really the SM58 capsule, which many still deem to be the industry standard when it comes to miking vocals. There were few consistent negatives reported, only that a few buyers found a difference in EQ and sonic tone between the 2 mics, and some complained that it doesn't have a mute button. This is the cheapest way to get two Shure wireless mics. This provides you with the same SM58 microphone capsule as the higher priced SLX system, but comes in at a lower price because it's using the BLX range of receivers which only provide 96 selectable frequencies and can only be used with a maximum of 12 compatible systems simultaneously. If you are mainly going to be using your wireless mics in a typical band setting then this is the better Shure option to go for because you won't need to expand beyond 12 mics. There were very few negative comments from reviewers with the only issue coming up several times was that it only has an on/off switch with no mute button. 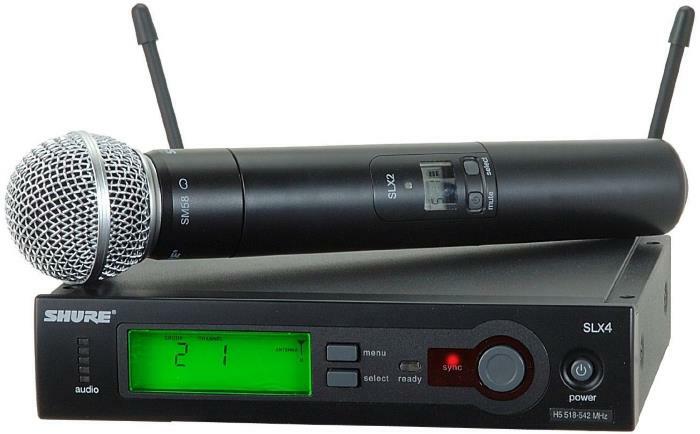 This is the lowest priced rack mountable wireless system currently with a Shure SM58 mic capsule - the BLX24/SM58 is the same other than the fact it's not rack mountable, making it $50 cheaper - check availability at Amazon.com. 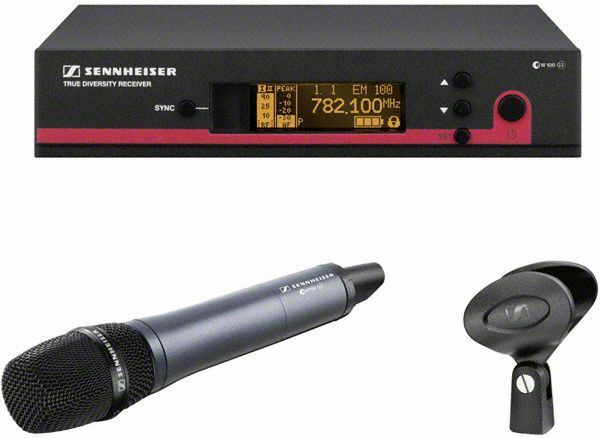 This system uses the Sennheiser e835 dynamic microphone capsule which has good ratings as a live vocal mic and competes in the same class as the Shure SM58. It features 12 channels which can be selected automatically or manually and you can use multiple units on stage at the same time. One handy feature is that the on/off switch is positioned at the bottom of the mic so signers don't end up turning it off accidentally during performance. This wireless system is a good alternative to the Shure BLX24R/SM58 for those of you who prefer the Sennheiser e835 over the SM58. This features the same capsule as the famous Shure SM58 which is the most popular wired vocal dynamic mic in use today. Owners who reviewed it were very positive about both the sound quality and the ease of use - particularly the automatic syncing function. I was unable to find any consistent complaints about the SLX24/SM58. The SLX receiver is Shure's mid-range analog receiver which has 960 selectable frequencies and can work with up to 20 compatible wireless microphones. 12 channels available in all areas with up to 20 channels in regions that allow it. If you want a Shure SM58 system and you won't need to expand beyond using 12 of them, then go for the cheaper Shure BLX24R/SM58 above. The Sennheiser EW 165 G3's distinction is its use of a condenser mic capsule, which allows for a wider frequency response than conventional dynamic microphones. This wider frequency response allows for more sonic nuances and improved clarity, which many vocalists prefer. Combining this highly sensitive mic with a reliable wireless system makes for a great mic that captured the hearts of many of its users. It features a fully programmable receiver, with twenty frequency banks and 12 preset frequencies each, allowing for quick setups. There's also a special sound check mode that lets you check the RF signal and audio discretely. Many were very happy with the Sennheiser EW 165 G3's overall performance, but most of the praises came from singers and vocalists who felt that they sounded and performed better with this mic. Ease of use and reliability were also pointed out along with its solid construction. There was one person who had some bones to pick with the included mic clip being too tight, but most are impressed with its overall performance. If you're looking for a high quality wireless condenser microphone then the Sennheiser EW 165 G3 is a worthy investment. The Importance of FCC 2020 Compliance As of July 13, 2020 new regulations from the FCC will come into effect and as a result some older wireless systems will no longer be able to be legally used in the United States. The frequencies that you will no longer be allowed to use from that date forward are 617-652 MHz and 663-698 MHz. All of the wireless microphone systems that we have recommended allow you to operate outside those frequencies and are compliant with the new regulations. For more information read this FCC consumer guide. Number of Channels. This determines the maximum number of compatible systems you can use at the same time. For example if you need to use 20 wireless mics then you'd need 20 channels so you can run 20 systems simultaneously. Range. The ranges presented above are for line of sight where you can see the receiver from where you are using the mic. If you are going to have obstacles, such as walking around a crowd of people as you might in a theater restaurant or house of worship, then it's best to get one with at least twice the range as the actual distance to the receiver. For the kinds of gigs most bands play you won't really need to go beyond 150 feet. Receiver Frequency. If you, or someone else nearby, are using other wireless systems for mics or instruments, then be sure to check which frequencies they use and get a new wireless mic system that runs on a different frequency range. You can find the frequency in your manual or printed on the back of your receiver. Analog vs Digital. Theoretically digital systems should provide slightly less noise at long range and slightly better dynamic and frequency response. The reality is that for most music and worship applications the analog systems are rated higher than their more expensive digital cousins - as a result the top ranked systems above are all analog. There is one significant functional difference - if you need to encrypt the signal then you have to go digital, but that's not a concern for most common uses. For this 2018 update, we stuck with the game plan by limiting the list to just the popular and top rated wireless microphone systems that are available. Like the previous iterations, we limited the scope to systems with handheld mics. We ended up gathering around over 4100 reviews and ratings, which we then processed via the Gearank algorithm. For more information about our methods see How Gearank Works. Like with most things in life, you get what you pay for. The cheaper systems tend to have lower spec'd mic capsules, while the more expensive ones tend to have mics that are well respected in sound reinforcement circles. Submitted by Karen (not verified) on Jun. 27, 2016. Hi, I would like to buy a system for primary school performances where as many children as possible can wear lavalier microphones and their voices are broadcast to the audience. Any help much appreciated. Submitted by Jason Horton on Jun. 28, 2016. We would need more information before we can offer any advice. What is the main use the system will be for - plays, musical theater, choir? How many children do you want to mic? Do you already have a PA System, and if so, how many input channels does it have for microphones? Submitted by Marcelo (not verified) on Sep. 30, 2016. Hi, what's the best option for wireless microphones, headset type, for live singing? Thanks. Submitted by Jason Horton on Oct. 3, 2016. Submitted by Dan (not verified) on Oct. 31, 2016. My question is similar to Karen's. I run a Drama Club and I have approximately $556 to spend on wireless microphones. My District recommends Shure and they are great. I already run 4 Audio Technica sets (3 lavolier and 1 handheld) systems... I believe the lavolier are ATW-310s? Don't quote me on that. Anyways, I want to get the best bang for my buck and put as many as I can on stage without feedback destroying my speakers. The most important thing is range and mic sensitivity. We don't sing into it really so that's not that important. Submitted by Phillip (not verified) on Dec. 8, 2016. Do you have a "Best Wireless Microphone System Guide - Body Pack"? Submitted by Jason Horton on Dec. 8, 2016. We haven't done a guide on wireless headset systems with bodypack transmitters yet, but it is on the list of topics we're considering. Submitted by James (not verified) on Feb. 2, 2017. Hi, I have a Shure Lavalier BLX4 receiver and BLX1 body pack. I need a better Wireless handheld for toasts and such, but also more than 1 for karaoke. Is the PG58 double good enough, or should I get the 24SM58 single? If I get the single, can I pair another one later? Can I put any to my lavalier receiver and avoid getting either? Essentially, I'm willing to pay a little more to eventually have the fewest receivers and best mic's (in this range) over time. Does that all make sense? Please advise. Submitted by Jason Horton on Mar. 7, 2017. The PG58 receiver will be fine for handling both singing and speeches. If you go with a single receiver then you can add an extra one later but that will cost more in the long run, my preference would be to go the other way. Submitted by Jake (not verified) on Mar. 5, 2017. I want to upgrade my current array of 12 wireless microphones to 24. I have a sound board that supports that many channels. Do I need any other equipment to make sure there is no interference other than making sure my frequencies don't overlap? I've never run that many wireless mics at the same time, but the principal should still be the same - if they're on different frequencies then you shouldn't have a problem. Submitted by FredT (not verified) on Mar. 23, 2017. Looking for a REALLY basic plug & play system. To be used on an athletic field, receiver in a building 100' from mic. Ideally receiver has jacks for external antenna, (Metal building) and a SIMPLE single channel mic. (The last unit always had issues syncing mic and receiver.) Many different high school kids and parents using, so idiot proof simplicity is essential. Submitted by Jason Horton on Mar. 23, 2017. I can't suggest anything that is completely 'idiot proof' because if the receiver's not protected from passers-by they can turn it off or change settings while it's in use, and if you forget to replace the mic's batteries as needed then you'll also have problems. With those caveats in mind, I believe you would be best served by the Shure BLX24R/SM58. It's relatively easy to use, rack-mountable and the receiver has BNC connectors for both antennas. Avoid the cheaper non rack-mountable BLX24 receiver because it doesn't have the antenna connector you need. BTW - Although I could be wrong, I don't think there are any good single channel systems with BNC antenna connectors. Submitted by Gary (not verified) on Apr. 18, 2017. Looking to do Karoke in a catering space with a dance floor that is about 20x20. Already have Samson live!615 speakers. Would either of these wireless mics be ok? Stage v466 - Quad Vocal Wireless System - B Band or Samson Stage 200. Neither of those two systems made our short-list when we did the original research for this guide so we haven't kept any data on them. The systems listed above are the ones that we currently recommend. Submitted by Jerry Ken (not verified) on Apr. 26, 2017. Which is the best Wireless microphone you would recommend for a lead vocalist in a live band that plays both in and outdoors? All of the systems featured above will work just fine for your purposes - if you go for the GTD Audio 622H then you'll have a spare mic should you ever need it. Submitted by Hue Nguyen (not verified) on Jul. 8, 2017. The wireless microphone for the [PRODUCT NAME REDACTED] is posted on Amazon. Could you please let know what this system's Gearank score is for your list? Submitted by Jason Horton on Jul. 8, 2017. Sorry but I had to edit your post and remove the product name because we've had problems with advertising spam lately and we don't want to encourage it. To answer your question, that wireless mic system didn't rate highly enough to make our short list (many of its most favorable reviews are suspicious and possibly fake) so we haven't published a Gearank score for it. Submitted by Dave Prasad (not verified) on Sep. 19, 2017. 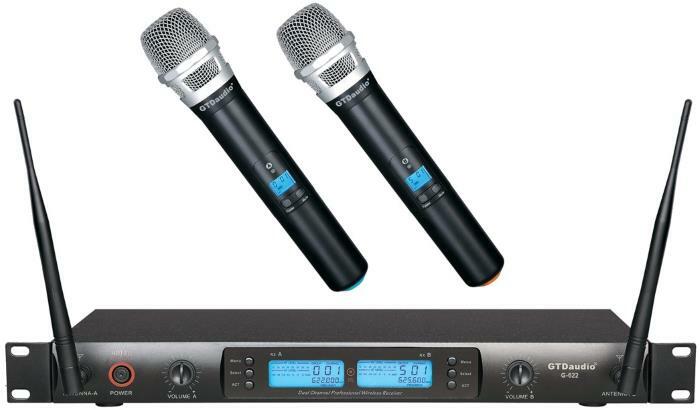 Looking to buy an affordable 4 channel wireless microphone system, to be used mainly for singing and preaching. Which one would you recommend? The one we recommend is the GTD Audio G-787H but I can see that they're out of stock a the moment. There is a cheaper one from the same manufacturer, and although it's not on our recommended list, it may suit your needs: GTD Audio G-380H. Submitted by D. Ha (not verified) on Oct. 11, 2017. The new FCC rulings no longer allow the use of 600MHz range for wireless microphones. Would you update your recommendations? The new FCC rules don't come into effect until July 13, 2020 - you can read more about that at fcc.gov/consumers/guides/operation-wireless-microphones. To answer your question, yes we are working on an update to our recommendations, but I don't have a publication date I can announce yet. Submitted by Jason Horton on Nov. 15, 2017. This guide has now been updated to reflect the FCC regulations that come into effect in 2020. Submitted by hien nguyen (not verified) on Nov. 1, 2017. This application is too far outside the use cases that we know about and research here at Gearank.com. Maybe one of our other readers will have advice for you, but most people using this guide do so for stage related purposes or something rather similar to that. Submitted by Jason Horton on Dec. 20, 2017. Today we removed the following system from our recommended list because the only remaining version available from the manufacturer is not compliant with the new FCC regulations: GTD Audio 622H. The updated version, G-622H, is now FCC compliant and has been reincluded in our recommended list as part of our March 2018 update. Submitted by Bryan Hazard (not verified) on Sep. 9, 2018. I do public address at sporting events in large gyms where I am mobile. I am in field houses that may be up to 100 yards long. What is the best system that has the best and largest receiver length? The Sennheiser EW 135 G3 was removed from the recommended list above today due to being discontinued - you can still read about it here. Submitted by Ron L Kocher (not verified) on Mar. 4, 2019. I need a VHF wireless mic on 76 - 88mhz with as close to the 50mw power limit as possible. RLKocher52@gmail.com 386 627 9330 Thanks!